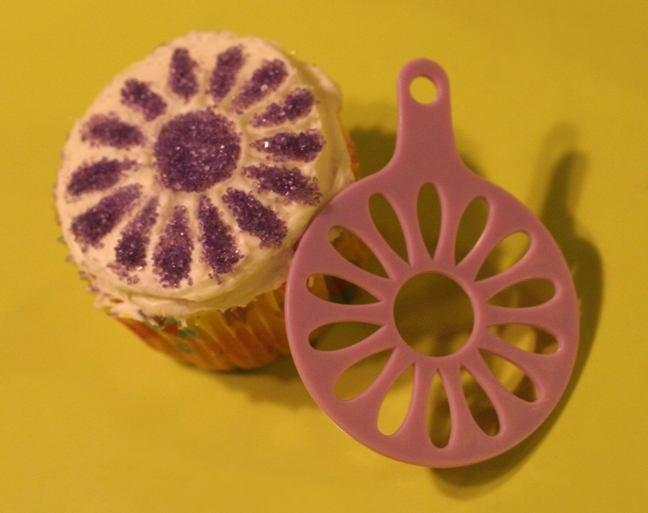 Cupcake templates: a mini giveaway for your gluten-free kid, plus a fun awareness idea! Does your g-free kid love cupcakes? Are you looking for a way to help spread awareness? Then here is the perfect answer: host a cupcake party! The National Foundation for Celiac Awareness (NFCA) and Pamela’s Products have collaborated on this idea, so find out more, be inspired and get out there and make a difference! 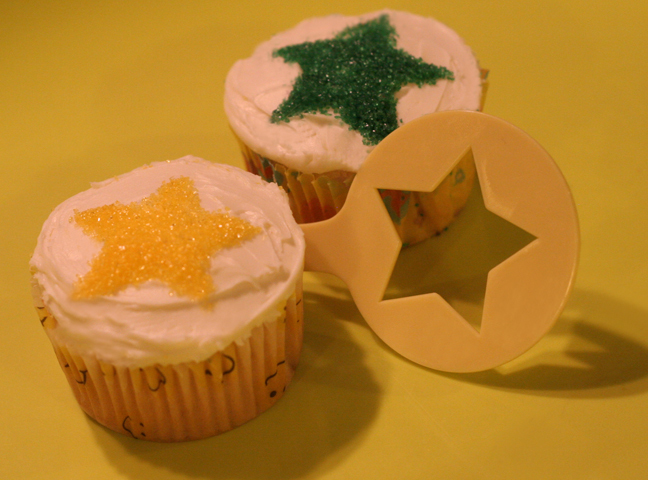 Decorating cupcakes with these templates is something your g-free kid can definitely help with. She can begin by holding the template flat while you show her how to sprinkle in the sugar (or nonpariels) evenly to fill up the template. Then, once she understands how it works, you can hold the template while she does the sprinkling. 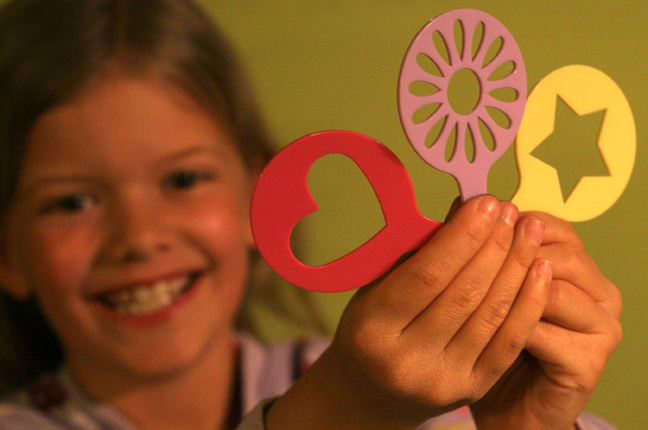 Wait until you see her pride and excitement when you take the template off and show her the final shape! try these on frosted brownies, cookie cakes or regular cakes. That being said, this giveaway is still simple: All you have to do is comment below, answering these questions: What does your family do to help spread awareness, and which cupcake or cake mix/brand/recipe is your favorite? This entry was posted in fun for kids, giveaways, kids in the kitchen, supporters and tagged celiac kid, desserts, expiriment, fun ideas, g-free kid, gluten free diet, holiday, kids, treats by kachalmers2. Bookmark the permalink. Just recently came across your blog and Facebook page. Love the ideas and discussion. Thanks from a family with a 4yo with Celiac! We bring our own food and share with others at events, etc and tell them why we are gf and let them see how good it tastes. Our favorite cupcake is making them from scratch using Namaste all purpose GF flour! We like the Betty Crocker gf cupcake mix. Though my mother in law made a cake from scratch last week that was to die for!! We spread awareness through conversation. When I hear of people saying they are I’ll or unexplained problems I urge them to get themselves (or their children) tested for Celiac disease. We try to educate everyone we come in contact with about celiac disease and the gluten-free diet. Our family has stuck to box mixes for our sweets but plan on adventuring to recipes later this spring/summer. We live Betty Crocker’s mix. I started a facebook support group (Celiac Disease Family Support Group). To help spread the word about Celiac we have talked to the kids at my daughter’s school and sent home info for the parents. We love going to sporting and 4-H events and there isn’t much she can have. We have been making more people aware of it and now people are bringing things just for her. Most people are open to the information and learning about it if you just be honest and tell them. When we make treats, we try to share them with others so they can understand gluten-free can be great. I love Pamela’s mixes. Thanks! Thank you for all the posts, my girls and I can not wait to make the st pattys stuff. We would LOVE to win this! We have only tried Betty Crocket GF Cupcake Mix. My son loves them. Oh those are so cute! My daughter would love to be able to make her cupcakes a little more fun! We have only been GF for a few months and have been using the Betty Crocker mix, but after reading some of these comments about people making them from scratch I may just have to try that (still learning :)). We try to talk to a lot of different people to help them learn and often we end up learning something new as well which is always great! I have been doing GF recipes for potlucks at work and everyone loves them! It is fun! My daughters favorite cupcakes are from the Betty Crocker devil’s food cake mix. It’s really the only one I’ve tried since she likes it (she’s really picky) and they freeze well so I can make them ahead for unexpected class parties, etc. I am just about to make a Super Celiac costume (like yours) for my daughter and a friend of hers that has Celiac also. We’re going to do a presentation to her class about what Celiac and gluten free means and we hope we’ll be able to present this to a larger audience at the school at the beginning of the year next school year. I have tried several brands of cake mixes & Bob Red mills is our favorite. When non GF people eat the cakes/cupcakes they have no clue its GF 🙂 My daughter loves the vanilla cake mix & I add chocolate chips to it! 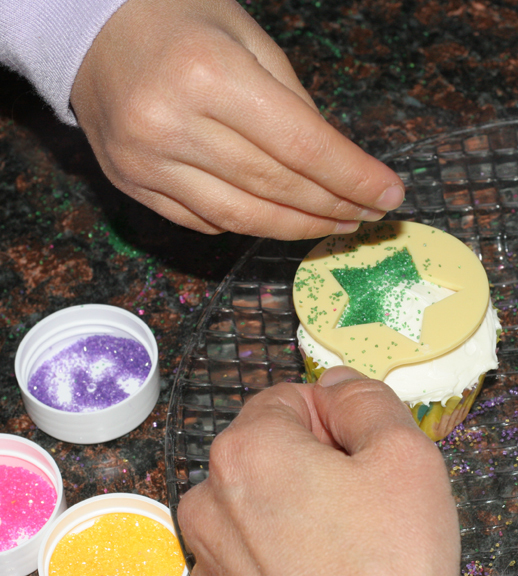 I searched online for the “best” gluten free recipe for my five year old grand-daughter’s birthday cupcakes last July….her first as a “gluten free kiddo”!! She doesn’t like chocolate, so they had to be vanilla and we were feeding alot of kids and parents. After cooking for about 12 hrs one day, I decided on the recipe that uses Betty Crocker GF cake mix, instant vanilla pudding and orange juice (yep!! It works!!) They are the best cupcakes and all the parents couldn’t believe they were gluten free…we made alot of people aware that GF was not the end of the world! My 4yo (Wed March 21st that is) girls are not just GF but are also RF (Rice Free) so it was a challenge to find products that work for them. For now we mostly use Chebe & Bob’s Red Mill mixes for things & the kids LOVE their BRM Chocolate Cake Mix. They are on pins & needles waiting for cake on Wed. I spread awareness by openly discussing why my girls can’t just eat what’s at a party or restaurant. I get looks at times when I whip out their own foods at parties but once people are educated they admire what I do for my kids so they are not left out. I also only make GF & RF foods when I have parties for my girls or their brother (he’s 6 & is artificial dye free) and people are always surprised when they realize just how good & yummy GF & RF foods are. My kids have me send the book “Adam’s Gluten Free Surprise” with them to school so the other kids and teacher have a better understanding of why they need to eat GF. We also participate in the Making Tracks for Celiacs Walk..this will be our 3rd year. My favorite mix for cupcakes is King Arthur chocolate cake mix. Those cupcakes look so yummy and adorable. My 4 yr old would just love them. He loves decorating his own treats. I am new to the website and so excited to have found you. Thanks for all the great ideas and information. We are relatively new to GF and need lots of help. We also love Bob’s Red Mill Chocolate cake mix. As far as getting the word out….we talk all we can with family, friends, caregivers at school, sitters and basically anyone that will listen about living GF. I even post articles and information on my FB and Twitter accounts to help raise awareness. Well, usually I get asked (while I’m out in public or @ friends’ get togethers) why I have to have different food. Then I explain to them why, and if they ask me how one gets tested for it I give them all the info (which tests their Dr. needs to run) Other times, I have friends give my number or email to a friend or relation that just got diagnosed, and I give them all the info I can to make it easier for them. Yay, wahoo, yippie. Ty ty ty ty. Kind of funny to win them tonight. My GF girls turn 4 tomorrow! 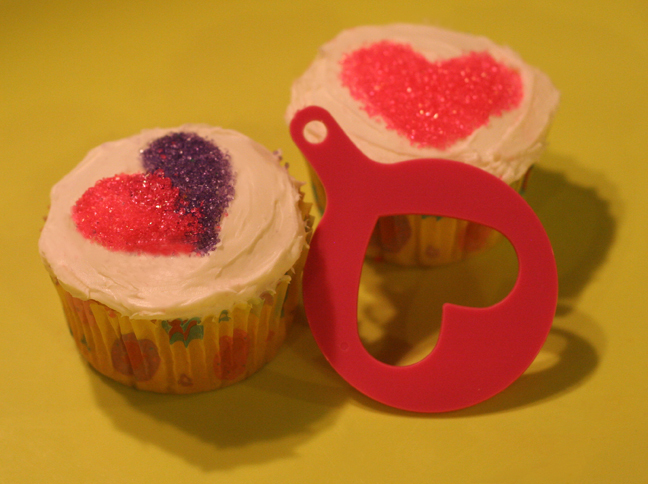 We leave baking cupcakes and I LOVE these templates! My son Jack was diagnosed with celiac disease over 3 1/2 yrs ago at the age of 2. I started a blog soon after called “Raising Jack with Celiac” to raise awareness of celiac disease and to help other parents on their journeys of raising their gluten-free kiddos.